On July 8, voters on the more than 17,000 islands that make up the vast archipelago nation of Indonesia went to the polls to elect the country's President. A final count has yet to be completed, but all signs suggest that Susilo Bambang Yudhoyono, the incumbent candidate, notched up a resounding victory. Since winning the country's first competitive election in 2004, the former general has been a cool steward of Indonesia's young and often chaotic democracy, denting the country's grim legacy of corruption, cracking down on radical Islamist groups and rebuilding a nation that suffered the brunt of 2005's devastating Indian Ocean tsunami. SBY  Yudhoyono is widely referred to by his initials  is seen as a moderate and honest figure in a nation still emerging from decades of cronyism under the deceased military dictator Suharto. When his triumph is certified, he will become the first President to be re-elected in what is the world's most populous Muslim democracy.  Born in 1949 into a lower-middle-class military family in eastern Java, Indonesia's most densely populated island.  After graduating at the top of his class in the Indonesian national military academy in 1973, he went on to join the army's top brass, and ultimately served as a military observer for U.N. peacekeeping operations in Bosnia during the mid-1990s.  First shone politically in 2001, when he stood up to then President Abdurrahman Wahid  who was facing impeachment charges  by refusing an order to declare a state of emergency. For supporters, the act sealed his reputation as a man of integrity. During his presidency, a lasting peace deal has been negotiated with insurgents in the tsunami-struck province of Aceh. Has also drawn praise for blunting the influence of the Jemaah Islamiah, an al-Qaeda-linked terrorist organization, with a steady string of arrests and detentions. 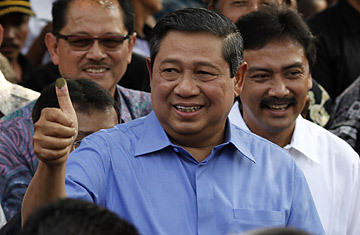 In the July 8 election, SBY's two main opponents fielded running mates who were also prominent generals under Suharto. SBY, though, was the only one of the three not being pursued on charges of human-rights abuses. His choice of Boedino  an astute banker and political newcomer  as his running mate has been hailed as a sign that he intends to cut through some of the bureaucratic red tape that has been a hallmark of Indonesia's murky politics and has stalled the nation's growth in the past. Though considered to be an even-tempered, if not altogether unexciting, politician, he has a stated affection for music and has composed his own love songs. The latest compilation is titled My Longing for You. "I love the United States, with all its faults. I consider it my second country." "God willing, in the next five years, the world will say, 'Indonesia is something, Indonesia is rising.' "
"Today is the people's day." "Even though SBY was a senior member of a deeply unpopular government, he has come to be seen as a victim of that government rather than part of it." Read about the lead-up to the Indonesian election.